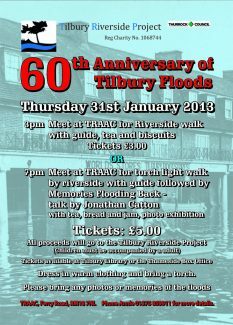 To mark the 60th anniversary of the floods on 31st Jamuary, 1953, The Tilbury Riverside Project and Thurrock Council have organised an event that will enable residents to relive their memories of that night and the weeks that followed. In the afternoon, starting at here will be a guided walk followed by tea and biscuits. This will start at the Riverside Arts and Activity Centre at 3.00pm and costs £3.00. In the evening there will be a torchlight walk followed by a talk from Jonathan Catton, a photo exhibition and 1950s style refreshments. This will start at the Riverside Arts and Activity Centre at 7.00pm and costs £5.00. 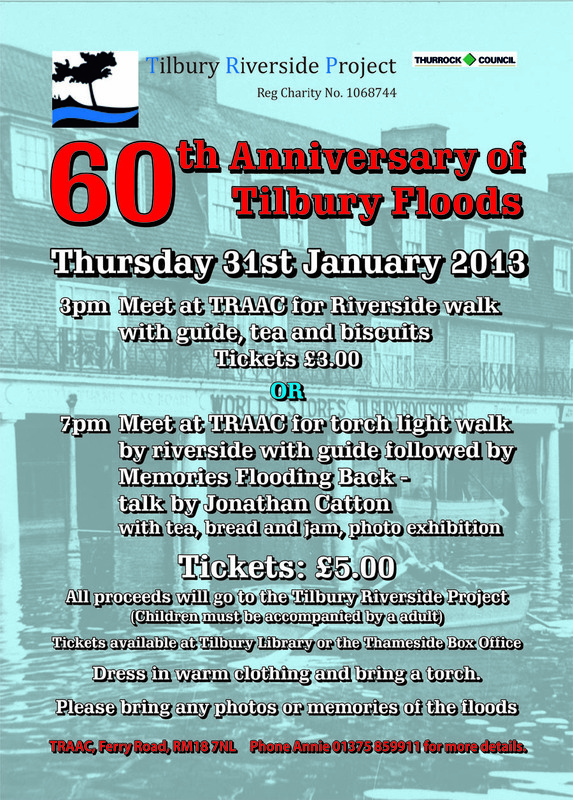 All proceeds will go to the Tilbury Riverside Project. Thank you for your comment………..we all had a good time! Well done Jonathan and team, a great day and evening. The 5 tea ladies dress up brought back the memories.